Italian and Sicilian cooking may have always been Peter McAndrews’ true calling, but it wasn’t until recent years that he introduced gluten-free dishes into his culinary repertoire. 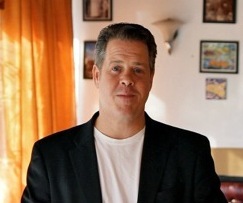 McAndrews began cooking at an early age and by his teens, he knew the restaurant business was for him. He studied at the Culinary Institute for Foreigners in Piedmont, Italy, and - notwithstanding his Irish heritage - has made his mark on the area's Italian food scene. 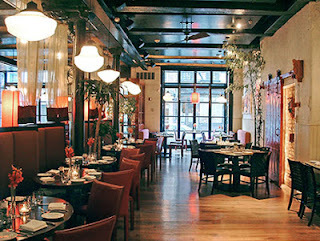 The idea of gluten-free Italian food may raise some eyebrows to the uninitiated but, explains McAndrews, “the Mediterranean diet is very vegetable forward and lends itself well to gluten-free dining.” McAndrews says because his menu is authentic, it can be tailored to accommodate a special diet. Polenta and risotto, staples of Italian cuisine, are naturally gluten free. When substituting pasta, McAndrews says he prefers corn, as opposed to rice, because of the taste and texture. And his gluten-free pizza, available at his newest restaurant La Porta, is his kids’ favorite. Natives and tourists hankering for a real Philly trademark need look no further than Paesano’s sandwich shops in Northern Liberties and on 9th Street at the Italian Market. Not only did McAndrews' "Paesano" - made with beef brisket, horseradish mayo, roasted tomato, pepperoncino, sharp Provolone, and a fried egg - edge out Bobby Flay's version in a Food Network “Throwdown!” he also offers the closest thing to a gluten-free cheesesteak that there is in town. “Folks are very excited to be able to have a Philly favorite [that's] gluten free,” says a proud McAndrews. 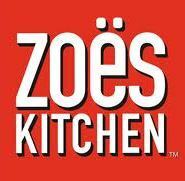 Mediterranean-inspired comfort foodery Zoës Kitchen is entering the Philadelphia market with three locations in the early going. The first spot, in Collegeville at the Providence Town Center (161 Market St., Suite 6), will open on March 7. Expect spring openings for the company's first New Jersey location in Marlton at the Promenade in Sagemore (500 Rt. 73) and an outpost in Newtown at Goodnoe's Corner (104 Pheasant Run) in the space next to Jules Thin Crust. The Alabama-based chain offers a variety of soups and salads, kabobs and other entrees, and fresh sides on its gluten-free menu. All entrees and other items at Old City Indian restaurant Lovash (236 South St., 215-925-3881) are gluten free. And to round out the Philadelphia part of the post, after a hue and cry last week Washington Square West's Percy Street Barbeque (900 South St., 215-625-8510) has gone back to gluten-free sauces. Melt Down Grilled Cheese's first Delaware location will open in Newark (145 E. Main St., 302-737-1135) on March 5. Gluten-free bread will be on hand. Thanks to reader Jared G. for alerting me to the fact that the Marlton Whole Foods began stocking Glutino's new gluten-free toaster pastries, which prompted me to run out and pick them up. I reviewed them in my post on Tuesday and think they're worth seeking out. The Little Bakery in Blue Bell (921 Penllyn-Blue Bell Pike, 267-708-0984) is hosting a gluten-free cooking workshop on site Tuesday, March 12 at 7 p.m. Topics include flour mixes, substitutions, breakfast menus, soups, salads, dinner menus,desserts and party hors d'oeuvres. Cost is $40 and space is limited; call to RSVP. 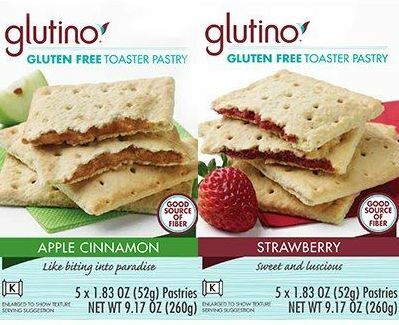 The world is a better place now that Glutino's gluten-free Pop Tarts toaster pastries have arrived. The Strawberry and Apple Cinnamon flavored treats are sold at Whole Foods markets ($4.99 per five-pack), with wider availability come springtime. Since I wasn't sure that the pastries would taste good right out of the foil package, I dropped one of each flavor into our toaster at the lightest setting. About 60 seconds later the tarts popped up, the centers a golden brown. My son and I had to curb our enthusiasm as we waited for them to cool down, but that beat the alternative of scalding the roofs of our mouths. The pastries were surprisingly flaky and the fruit filling runs nearly from end to end, save for a thin crust. Both were tasty, although we both preferred the strawberry one. I imagine that for most people, the "toaster" part of toaster pastries is a mere suggestion. Thus began our next trial - could the products hold up without warming? I'm happy to report that they can. The toasting certainly brings out more flavor, but room temperature is no deterrent. Frosting would be a welcome addition to future versions, but they stand on their own just fine. 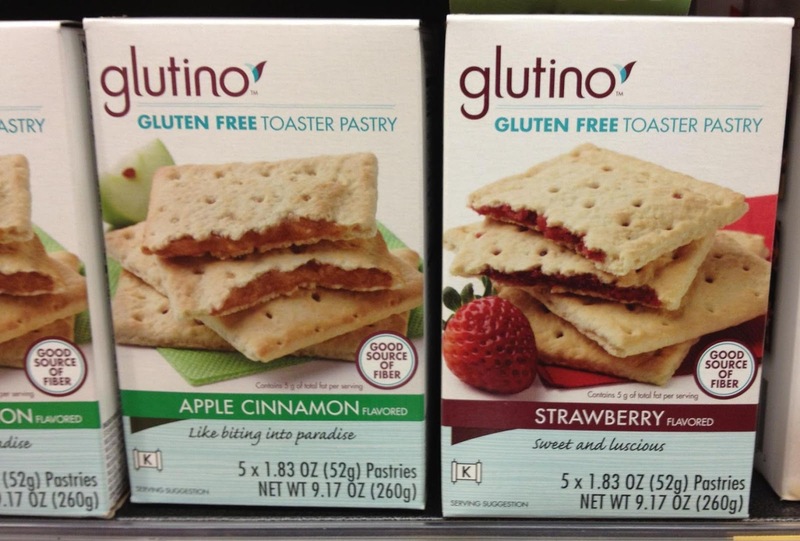 At a buck per pastry, the Glutino toaster pastries aren't cheap. (There is a link to a cents-off coupon at the Glutino homepage.) Given that these products fill a void in the gluten-free marketplace, however, it's worth a splurge for the novelty and convenience. Dos Gringos Mexican Kitchen in Media (113 S. Olive St., 61-565-7794) has marked gluten-free items on its menus. The new Corner Foodery near Rittenhouse Square (1710-12 Sansom St., 215-567-1500) has an entire fridge full of gluten-free ciders and beers. including Fox Tail Ale, the first gluten-free beer in a can. California Pizza Kitchen is planning to test a gluten-free pizza crust later this year. Hopefully, the testing will iron out the cross-contamination issues that forced the chain to pull the plug on a similar offering back in 2011. 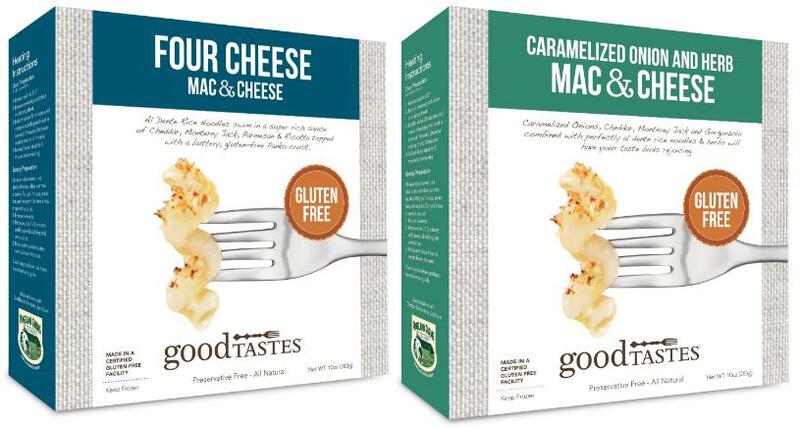 Some fancy macaroni and cheese is coming. Good Tastes is rolling out two gluten-free varieties: Carmelized Onion & Herb (with Cheddar, Monterey Jack and Gorgonzola) and Four Cheese (made with Cheddar, Monterey Jack, Parmesan and Ricotta). The products are made in a certified gluten-free facility. You'll find them in the frozen food aisle at Whole Foods markets. Whole Foods will open its first Cherry Hill location at the Ellisburg Circle Shopping Center at Route 70 and Kings Highway. The grocer will occupy a 47,000-square-foot section of Ellisburg Circle's 267,000 square feet of total space and is expected to open in 2014. By way of comparison, the Cherry Hill store will be slightly larger than the chain's Plymouth Meeting location that opened in 2010. As I wrote on Tuesday, there are many new gluten-free products debuting for Passover, including a chocolate chip cookie cereal, red velvet macaroons and another line of matzos. The Greater Philadelphia Celiac Support Group is having a vendor fair in conjunction with its upcoming semi-annual meeting on Friday, March 15 at Abington Memorial Hospital. The vendor fair runs from 5:45 p.m. to 7:30 p.m. Vendors interested in participating should email Ellen Gaffney to reserve space. The meeting itself will begin at 7:30 p.m. and will feature Dr. Keith Laskin of the Paoli Celiac Center, speaking on non-responsive Celiac Disease. It's not too late to RSVP for CHOP's pediatric Celiac Disease education day on Sunday, March 17. Call 215-590-2985 to register. Dozens of new gluten-free items are available this year, including another gluten-free matzo from a company that is synonymous with Passover. As the holiday draws closer, many of these products will be more widely available, but your best bet is looking for them at a market with a large kosher section, such as the ShopRite markets on Roosevelt Boulevard in northeast Philly and in Cherry Hill on the old racetrack grounds along Route 70. Wegmans stores also have an expanded selection. Manischewitz has ventured into the world of gluten-free matzo with two products: Gluten-Free Matzo-Style Squares and Gluten-Free Crackers, similar to the company's famous Tam Tams. The company has brought back the gluten-free Yellow and Chocolate Cake Mixes that debuted last year, and has added to its already wide selection of macaroons - all of which are gluten free - with a red velvet flavor. Another new product from Manischewitz is frozen macaroon dough. Yehuda isn't standing pat on the gluten-free front. The company's plain and toasted-onion matzo-style squares and cake meal are joined this year by fiber-enriched squares along with matzo meal, farfel and crackers (available in Original and Cracked Pepper). Another old-line matzo maker, Streit’s, debuts gluten-free Matzo Ball Mix, Matzo Ball & Soup Mix and Israeli Couscous. Jeff Nathan Creations has brought back the Plain version of its gluten-free panko flakes and introduces a Seasoned variety. On the sweet side, Manischewitz has another gluten-free cereal called Magic Max's Chocolate Chip Cookie Cereal, a reasonable-looking facsimile of Cookie Crisp. Also from that company are Guiltless Gourmet Flaxseed Crunch Bars in two vegan and gluten-free flavors, Almond Cranberry Flaxseed and Cashew Cranberry Flaxseed. Gefen has given its Passover cereal line a makeover, changing the packaging and the name from King Krunch! to Krispy Krunch. Lieber's has three gluten-free granola varieties: Original, Chocolate Chip and Cranberry. The brand has also extended its line of Passover cookies to include vanilla and chocolate sandwich cremes. 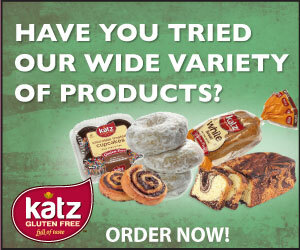 About a week or so before the start of Passover, markets receive their shipments of fresh gluten-free cakes and cookies from New York bakeries such as Oberlander's, Shabtai Gourmet, and Schick's. Look for sandwich and rainbow cookies, cake rolls and layer cakes. If you want to try "Mexican Coke" (made with sugar rather than high-fructose corn syrup), Passover Coca-Cola will be available in the Philadelphia area. Look for bottles with a distinctive yellow cap. Returning this year are gluten-free chow mein noodles from Streit's and Paskesz, a variety of gluten-free pastas from Manischewitz and Gefen, and gluten-free pizza bagels and flatbreads. At Celina's Mulberry Market and Grille in Galloway (68 W. Jimmie Leeds Rd., 609-404-1700), you'll find gluten-free burger rolls and bread for sandwiches. In Cinnaminson, Due Amici (2114 Branch Pike, 856-303-8828) has gluten-free ravioli served with pomodoro sauce. Marcello's in Marlton (300 E. Greentree Rd., 856-596-0984) offers three kinds of gluten-free pizza and three different gluten-free pasta dishes. Lady Victoria Tea Room, located at Rosebush Antiques and Gifts in Levittown (1337 E. Lincoln Hwy., 215-943-3220), has a gluten-free menu that includes sandwich bread and desserts. (Thanks, Joanne R.) Another tea room - The Talking Teacup in Chalfont (301 W. Butler Ave., 215-997-8441) - has gluten-free bread and scones. Red Robin opened its newest New Jersey location in Deptford (1750 Deptford Center Rd., 856-845-7583) this week. Gluten-free burger buns and fries from a dedicated fryer are available. 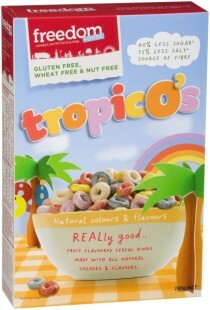 Several gluten-free cereals made by Australia's Freedom Foods, including one similar to Froot Loops, are now sold at area Whole Foods markets. The number-one rated chocolate in the world is made in Switzerland but available in Philly. As I wrote on Tuesday, Teuscher's champagne truffles are a worthwhile upgrade for Valentine's Day next week. Tickets for Celiac Awareness Night at the Phillies are now available for purchase. The game is on Friday, August 16 against the Los Angeles Dodgers. Net proceeds from tickets bought using code CELIAC will go to support raising celiac awareness. Many publications run “Top 10” and “Best of” lists, but some hold more cachet than others. With its heritage, National Geographic Traveler magazine is more than qualified to opine on the world’s best. So with Valentine’s Day approaching, it’s worth trumpeting the fact that the magazine’s recently crowned Best Chocolatier in the World sells its creations right here in Philadelphia. Teuscher Chocolates of Switzerland beat out highly regarded confectioners like Godiva, Scharffen Berger and Jacques Torres. 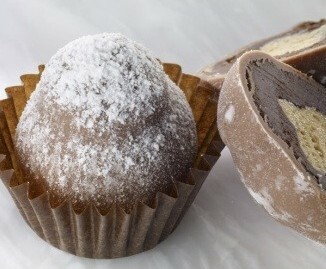 Teuscher (pronounced “toy-sure”) is best known for its signature Champagne Truffle. This truffle was created 80 years ago by Dolf Teuscher, Sr. Teuscher uses Dom Perignon to create a champagne crème, which rests in the center of a dark ganache. The recipe has never been changed or altered at all; the recipe and formula are known by only two people in the world. Because Teuscher doesn’t use preservatives, the truffles have a short shelf life of about three weeks; the company's pralines and other confections last from six to 12 weeks. There is no gluten in the chocolates or specialty fruit jams, the cacao beans are fair-trade and organic, and there are vegan-friendly options. Philadelphia is home to one of only 10 Teuscher shops in the U.S. Teuscher Philadelphia has been operating from The Shops at The Bellevue (200 S. Broad St., 215-546-7600) since 2007. 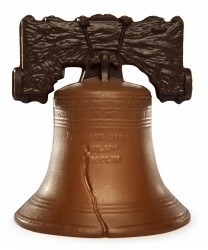 In addition to offering exclusive Philly-themed boxes filled with an assortment of chocolates, father-and-daughter owners Bruce and Rachel Goldberg also sell chocolate Liberty Bells. Teuscher's confections are prepared daily in Zurich and flown in weekly. The Philadelphia store is open seven days a week and orders can be placed online or by phone. West Avenue Grille offers gluten-free pancakes at its locations in Jenkintown (718 West Ave., 215-886-1540), Dresher (1650 Limekiln Pike, 215-367-5428) and Southampton (233 2nd St. Pike, 215-942-6290), and other menu items are or can be made gluten free. Thanks to Jaime L. for the tip. Pancakes are also an option at Atiya Ola's Cafe, a raw/vegan cafe in West Philadelphia (4505 Baltimore Ave., 215-939-3298), says reader Laura G.
Reader Pam V. let me know that Old City's Farmicia (15 S. 3rd St., 215-627-6274) has a gluten-free menu. Roberto Cafe near Rittenhouse Square (2108 South St., 215-545-0793) serves gluten-free pasta, as does Luna Rossa Biagio Lamberti in Turnersville (3210 Rt. 42, 856-728-4505). The Saxby's Coffee location in University City (4000 Locust St., 215-222-8400) is now carrying gluten-free sweets from The Little Bakery, as is Ana's Corner Store in East Norriton (3310 N. Wales Rd., 610-279-3100). Tis' the season - for skiing, that is. In Tuesday's post, I shared word of the gluten-free options available at ski resorts at the Poconos and other day's-drive spots. 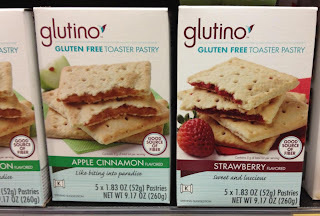 The big product news this week was the unveiling of Glutino's toaster pastries in Apple Cinnamon and Strawberry varieties. Whole Foods Markets will be the first to stock these treats. You can print a 55¢ off coupon via the Glutino website. At Trader Joe's, I discovered an new gluten-free all purpose flour, sold in 1 lb. bags for $3.99 each. 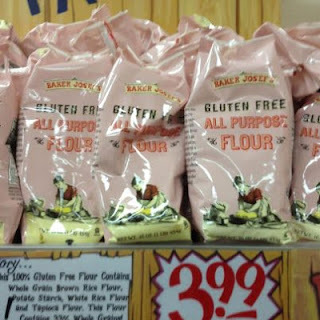 Gluten Free on a Shoestring has reviewed the product and ventures that it's made for TJ's by King Arthur Flour. Tickets will soon be on sale for Celiac Awareness Night at the Phillies, this year to take place on Friday, Aug. 16, when the Phightins take on the L.A. Dodgers. I hope to have some news on gluten-free options for the 2013 season in the next few weeks.